At ASU GSV April 8-10, CZI will highlight its efforts to leverage technology, community-driven solutions, and collaboration to accelerate progress in education, science, and criminal justice reform. Today, the Chan Zuckerberg Initiative announced its participation in the 10th annual ASU GSV Summit, sharing a series of experiences on our efforts aimed at equipping those on the frontlines — teachers, advocates, scientists — with the necessary research and tools to accelerate progress towards a more inclusive, just, and healthy future for everyone. CZI leaders in education, technology, and impact investing will share the ways we are working to help ensure that every student receives an education tailored to their individual needs and supportive of every aspect of their development. In a keynote address, CZI Co-Founder and Co-CEO Priscilla Chan will share CZI’s vision for its Education work — and how that approach was in part shaped by her personal experience as a pediatrician and teacher. 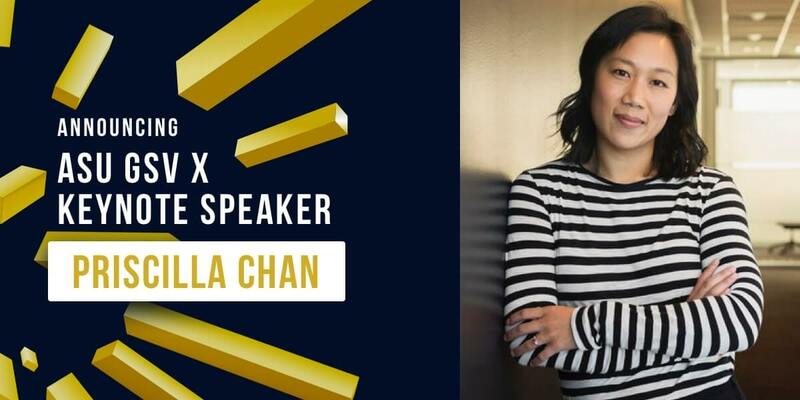 Tuesday, April 9 | 12:00 p.m. to 1:30 p.m.
CZI Co-Founder and Co-CEO Priscilla Chan will share how her time as a pediatrician and educator shaped her desire to make learning more tailored to the comprehensive needs of each child, and CZI’s support of that vision in its efforts to translate learning and developmental science into classroom practice. Priscilla’s keynote will be followed by a Q&A with Co-Founder and President of Populace Todd Rose. Wednesday, April 10 | 10:00 a.m. – 10:50 a.m. Hear CZI Vice President of Learning Science Dr. Bror Saxberg and Director of Whole Child Development Dr. Brooke Stafford-Brizard talk about the connections between classroom practice and the latest scientific discovery in learning science and human development — and why these links are critical to ensuring that all students enter adulthood with the skills and abilities needed to reach their full potential. How Do You Measure “Social Impact” in the Education Sector? Wednesday, April 10 | 2:45 p.m. to 3:25 p.m.
Join a moderated discussion with leading education sector investors on the strategies they are using to grow, measure, and report on educational quality and social impact. This panel includes CZI Managing Partner of Ventures Vivian Wu, as well as speakers from ReThink Education, Omidyar Network, Owl Ventures, and Rise Fund. How do we expand access to quality job opportunities — and lives of success and dignity — for those with criminal records? This panel includes CZI Manager of Technology and Program Delivery Aly Tamboura, as well as leaders of the Anti-Recidivism Coalition and The Ladies of Hope Ministries.